1. Orandi A. Transurethral fulguration of bladder diverticulum: new procedure. Urology 1977; 10:30. 2. Vitale PJ, Woodside JR. Management of bladder diverticula by transurethral resection: reevaluation of an old technique. J Urol 1979; 122:744. 3. Parra RO, Jones JP, Andrus CH, Hagoor PG. Laparoscopic diverticulectomy: preliminary report of a new approach for the treatment of bladder diverticulum. J Urol 1992; 148:869-871. 4. Das S. Laparoscopic removal of bladder diverticulum. J Urol 1992; 148:1837-1839. 5. Gill IS, Kerbl K, Clayman RV. Laparoscopic surgery in urology: current application. Am J Roentgenol 1993; 160(6):1167-1170. 6. Jarrett TW, Pardalidis NP, Sweetser P, Badlani GH, Smith AD. Laparoscopic trans peritoneal bladder diverticulectomy: surgical technique. J Laparoendosc Surg 1995; 5(2):105-111. 7. Nadler RB, Pearle MS, McDougall EM, Clayman RV. Laparoscopic extraperitoneal bladder diver-ticulectomy: initial experience. Urology 1995; 45:524-527. 8. Zanetti G, Trinchieri A, Montanari E, et al. Bladder laparoscopic surgery. Ann Urol (Paris) 1995; 29(2):97-100. 9. Iselin CE, Winfield HN, Rohner S, Graber P. Sequential laparoscopic bladder diverticulectomy and transurethral resection of the prostate. J Endourol 1996; 10(6):545-549. 10. Anderson KR, Clayman RV. Laparoscopic lower urinary tract reconstruction. World J Urol 2000; 18(5):349-354. 11. Fukatsu A, Okamura K, Nishimura T, Ono Y, Ohshima S. Laparoscopic extraperitoneal bladder diverticulectomy: an initial case report. Nippon Hinyokika Gakkai Zasshi 2001; 92(6):636-639. 12. Porpiglia F, Tarabuzzi R, Cossu M, et al. Sequential TurP and laparoscopic bladder diverticulectomy: comparison with open surgery. Urology 2002; 60(6):1045-1049. 13. Khonsari S, Lee Dl, Basillote JB, Mc Dougall EM, Clayman RV. 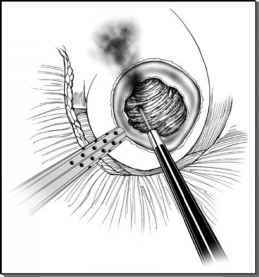 Intraoperative catheter management during laparoscopic excision of a giant bladder diverticulum. J Laparoendosc Adv Surg Tech A 2004; 14(1):47-50. 14. Porpiglia F, Tarabuzzi R, Cossu M, et al. Is laparoscopic bladder diverticulectomy after transurethral resection of the prostate safe and effective? Comparison with open surgery. J Endourol 2004; 48(1):73-76. 15. Faramarzi-Roques R, Calvet C, Gateau T, Ballanger PH. Surgical treatment of bladder diverticula: laparoscopic approach. J Endourol 2004; 48(1):69-72.